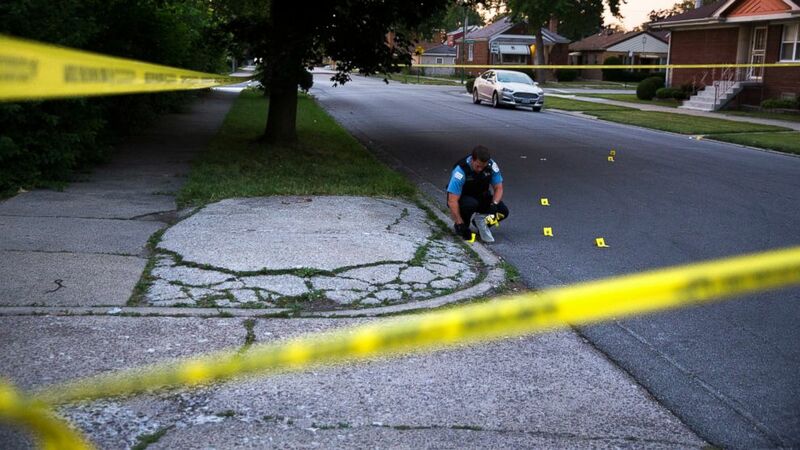 Homicides last year in Chicago rose at the fastest rate in 60 years. A long and violent year in Chicago ended with a record number of shootings and the most homicides in two decades, police say. The Windy City saw 3,550 shooting incidents and 762 murders last year, a grim total that works out to an average of more than two murders and nearly 10 shootings every single day. Homicides in Chicago jumped to their highest level since 1996, when 796 were recorded, according to historical data from the Chicago Police Department. Last year's total represents a 57 percent increase over 2015, the biggest spike in murders in Chicago in 60 years, according to the Associated Press. Shootings reached a record level since police began tracking them in 2011, rising nearly 50 percent over last year and nearly doubling since 2013. The number of shooting victims jumped to 4,331. The historic murder total drew a rebuke from President-elect Donald Trump, who said that federal law enforcement should be brought in to help with the crisis. Nykea Aldridge, a mother of four and the cousin of NBA star Dwyane Wade, was shot dead in August after being caught in crossfire while pushing her baby in a stroller on Chicago's South Side. In November, the 15-year-old grandson of U.S. Rep. Danny Davis, D-Ill., was shot dead over a pair of gym shoes. Tragically, dozens of children were caught up in the mayhem. In July, a 7-year-old girl was shot at a vigil for a 14-year-old boy killed earlier on the same day. The wounded 7-year-old was driven to the hospital by a woman, Ashake Banks, whose 7-year-old daughter was fatally shot in 2012. ABC News contributor John Cohen, a law enforcement and homeland security expert whose roles have included counterterrorism coordinator for the Department of Homeland Security, described the violence in Chicago as "spiraling out of control." 1. An increase in gang activity and violent behavior by career criminals. 2. An increase in the availability of illegal guns, coupled with an increase in criminals' willingness to use them. 3. And an increase in the reluctance by law enforcement to engage in proactive, violence prevention policies. Such hesitancy, Cohen said, is because "officers of various ranks are worried they will respond to a split-second decision and end up being the next person blasted all over the media and will lose their job." Officers respond to their calls for service and do what they can, Cohen said, but they are "hesitant to be proactive" and "target violent criminals." Criminals sense any hesitancy, Cohen said, and believe they are less likely to be stopped. Chicago police superintendent Eddie Johnson told the AP recently that officers have become more careful, partly because they're concerned about viral videos. Johnson added at a news conference last week that police officers are not the reason for the heightened violence in Chicago; he said over 8,000 guns were recovered in 2016 and all those encounters put cops at risk. (Armando L. Sanchez/Chicago Tribune/TNS via Getty Images) A member of the Chicago Police Department collects bullet casings at the scene of a shooting near the intersection of South Morgan Street and West 97th Street in Chicago on July 3, 2016. There is no simple explanation for why the violence is so extreme, Johnson told reporters last week, but he pointed to the prevalence of gang activity. He also noted that the "the anti-police rhetoric" in Chicago and across the country "has emboldened and actually empowered these gang members to do what they do." Gang members may believe community residents will take their side instead of the police's, he added. Johnson said the violence in Chicago is mostly on the city's south and west sides, in areas with a history of gang conflicts. Of the 12 killings in Chicago over Christmas weekend, he said, 90 percent of the victims had gang affiliations, criminal histories and were pre-identified by the department's "strategic subject algorithm" as being a potential offender or victim of gun violence. The majority of the 27 shootings Christmas weekend were "targeted attacks" by gangs against potential rival gang members at holiday gatherings, Johnson said. 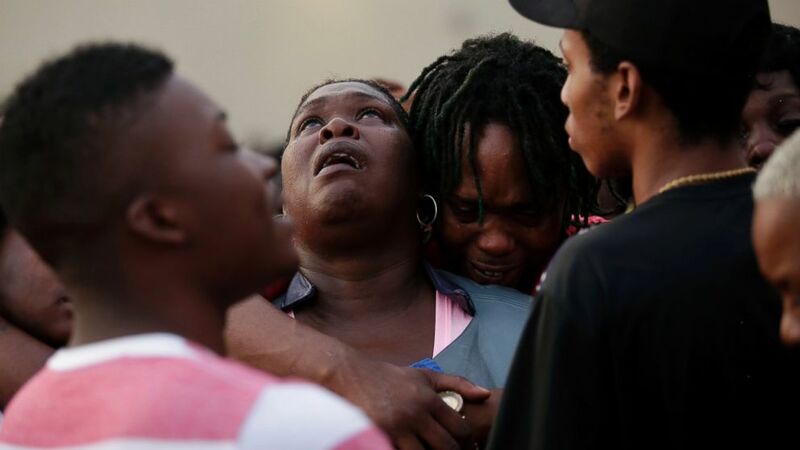 Cohen, the ABC News contributor, said the concentration of violence in specific neighborhoods can be explained by social issues, like a lack of education or employment, which he said can create a feeling of hopelessness for young people and may contribute to why they gravitate toward the violent gang lifestyle. Gangs not only provide income, Cohen said, but give young people a familial connection and sense of protection. "If we don't get a handle on this problem," Cohen said, "law enforcement officials that I've been speaking to are saying ... we'll see continuing increases." 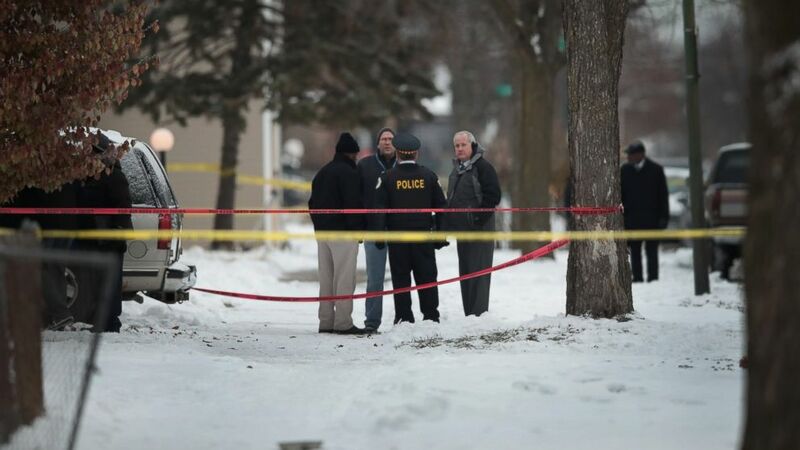 (Scott Olson/Getty Images) Police investigate the scene of a quadruple homicide on the city's Southside, Dec. 17, 2016 in Chicago. Three people were found shot to death inside a home in the Fernwood neighborhood, another 2 were found shot outside the home, one of those deceased. Chicago has had more than 750 homicides in 2016. First, he said, the police must identify and aggressively target violent gang members and other violent repeat offenders. "The overwhelming majority of violent crime is committed by people who have engaged in violent criminal activity," he said. Second, police "have to work to prevent illegal guns from getting into the hands of people who cannot legally possess them," Cohen said. "There's nobody on either side of the gun-control issue who thinks career repeat offenders ... should be able to possess a gun," he said. "And there are policing strategies that are directly focused on preventing stolen weapons from falling into the hands of violent gang members and repeat violent offenders. "Third, you have to address the underlying issues," Cohen said. Citing Los Angeles’ efforts in the 1980s and early-1990s, Cohen said that city successfully worked to address underlying issues in neighborhoods that contributed to a sense of hopelessness. As in Chicago now, L.A. crime then was spiraling out of control, driven by violent gang activity, he said. First, L.A. police initiated dramatic uniformed and undercover police presences; Cohen said he and other law enforcement officers zeroed in on South Central Los Angeles communities to find the most violent, repeat offenders and target them with federal prosecution. Also, authorities in L.A. worked with local government and community groups to address some of the underlying issues, like poor education opportunities, Cohen added. The aggressive enforcement, coupled with addressing the underlying issues, brought significant decreases in gang activity, and violent crime more broadly, in South Central Los Angeles, he said. Without addressing the underlying issues, Cohen said, "there will be a revolving door" of people who will engage in violent behavior. (Joshua Lott/Getty Images) Sheila Jones looks to the sky during a vigil for her daughter who was killed as she walked through her apartment complex July 27, 2016 in Chicago, Illinois. Cohen also cited trust between communities and police as something that’s missing nowadays in cities including Chicago, where he said law enforcement officers need to engage proactively with residents, understand what's important to communities and work with them. Cohen complimented New York City's police officers, saying they go to community meetings and ask what issues are important to the community, which "changes the dynamic" of the conversation. In return, people are willing to talk to officers about problems, he said, which creates personal relationships. Johnson, the Chicago police superintendent who called the level of violence in his city "unacceptable," is pushing for a legislative change to help curb the "reckless gun culture" in Chicago. Johnson said he hopes a new law will give judges autonomy to sentence repeat gun offenders to the middle- or high-end of the range, because he says repeat offenders are not willing to "play by society's rules." “I just don’t believe that we hold repeat gun offenders accountable for their actions," he told reporters Dec. 26, adding that the city must change the narrative so offenders don’t want to pick up a gun. Johnson hopes the legislation will give cops "a fighting chance" to hold offenders accountable to begin to change the narrative in the city. "We all have a vested interest in reducing this gun violence," he said. "It's not OK and it's not normal. When I go home and my neighbors see me, they are constantly asking what can we do to reduce this gun violence? "We know that the long-term solutions [are] to invest in these impoverished areas, provide more jobs, better education," Johnson said, adding, "The urgent solution right now is for state legislatures to help us with this gun bill. "If you pick up a gun and shoot somebody you should go to prison, period," he said. "You don’t get a pass from me."